This table came from a house (a beautiful, beautiful lake house ...) that Greg's company bought and is getting ready to re-sell. 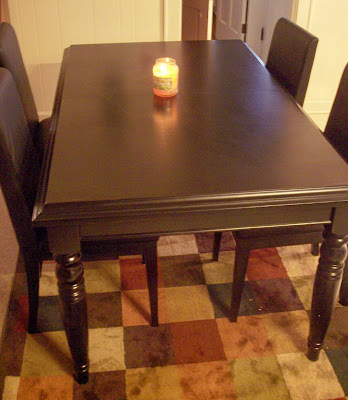 Greg included some extra money for some furniture, including this table that now has a nice place in our kitchen! Oh man! I love it! It looks really great. Does it match your new cabinets? I love it too, along with the rug. That's what I'm shopping for now.